EMU Used Class 411 (4-CEP) ???? as listed London Victoria - ??? Started Victoria (approx. 0900) , Lewisham, Crayford Spur, Lee Spur (Lee-Grove Park), also visited the Woodside-Selsdon line where a photographic stop was made at Coombe Road. Other routing I cannot remember but it was all on electrified lines in the South East London/Kent area. 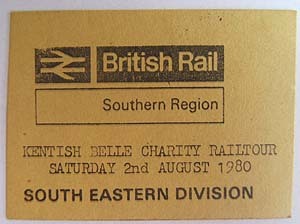 From Brian Halford's ticket collection.